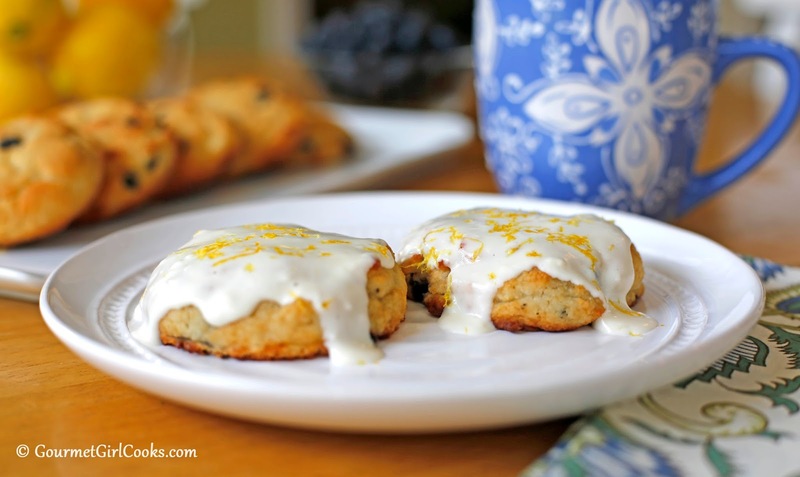 Since another holiday weekend is upon us, I wanted to re-share my recipe for Glazed Blueberry Breakfast Rolls that I created a couple of years ago that was inspired by one of my followers who asked for my assistance in creating a healthier version of one of her old favorites; Bojangles Bo-Berry Biscuits. 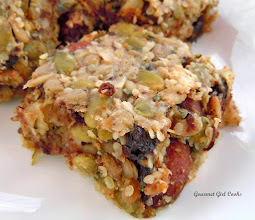 I thought these would be a perfect breakfast idea for the upcoming holiday weekend as we wind down summer. Since I had never actually tried a Bo-Berry Biscuit before, I had to do a little research (she also sent me a recipe for a conventional version of them as well; the original recipe had wheat and sugar). I must say that I was quite excited to have successfully created a grain free version. 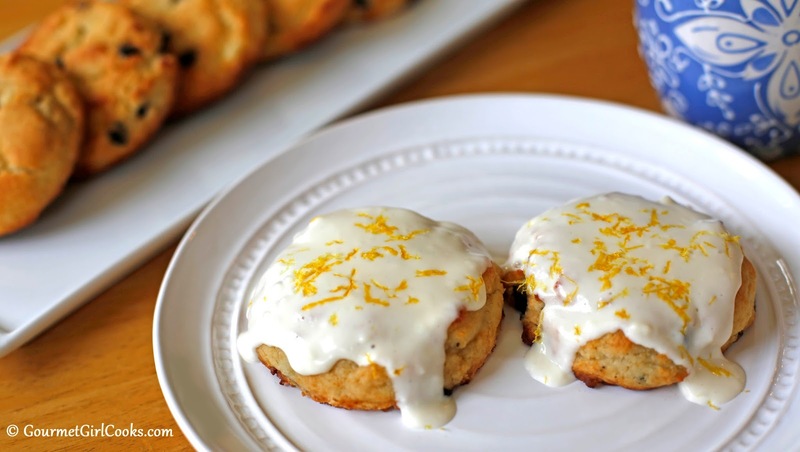 My recipe for Glazed Blueberry Breakfast Rolls was modeled after the Bo-Berry Biscuits from Bojangles. These rolls are amazing! They're topped with a vanilla glaze that can either be used as a fluffy vanilla frosting when chilled or a luscious vanilla glaze when warmed and spread over one of these warm sweet rolls. 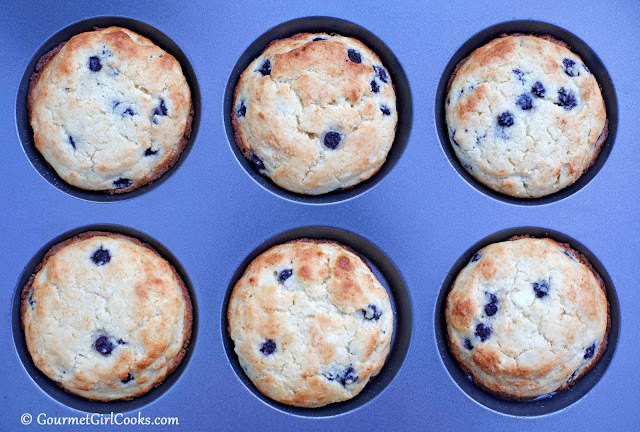 I tested them out with frozen organic wild blueberries as well as dried blueberries. I prefer to glaze them one at a time as I eat them. I simply pop one into the microwave for 10 seconds or less and spread it with the glaze mixture and let it melt and run down the sides. 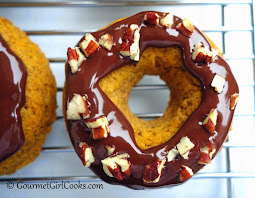 If serving them to a group, just glaze and top them all at once instead. You could toss in a couple diced strawberries and swap them for half of the blueberries if you wanted and topped with the white vanilla glaze, red strawberries and blueberries, they would make the perfect Labor Day Weekend breakfast! I found them to be a cross between a buttermilk biscuit and a sweet roll...you know, sort of a "biscuit-like sweet roll." Check out my photos and recipe below. Enjoy! 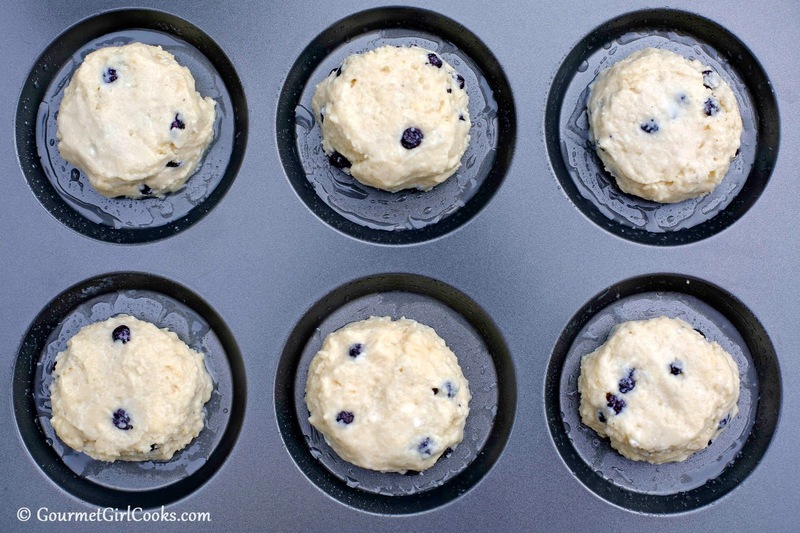 Preheat oven to 350 degrees F. Grease a muffin top pan or line a large baking sheet with parchment paper. In a medium mixing bowl, add almond flour, sweetener, baking powder, soda and salt; whisk to mix well. Add diced chilled butter and cream cheese. Using a pastry/dough blender, cut butter and cream cheese into dry ingredients until moistened and crumbly. 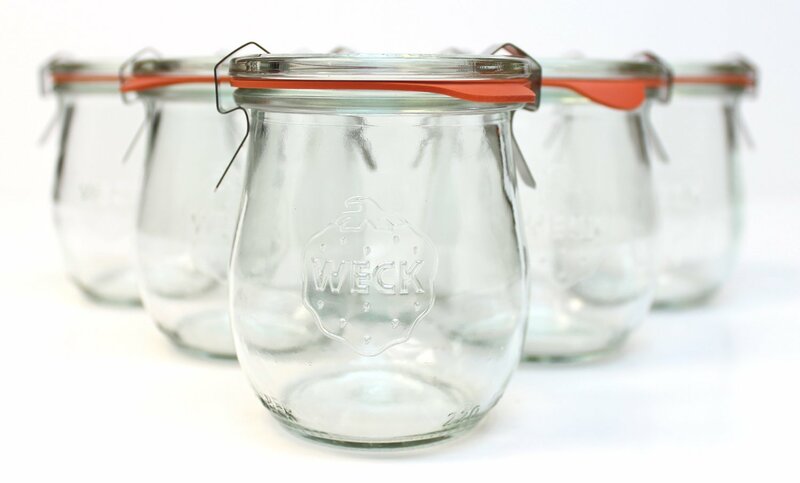 Crack both eggs into glass measuring cup; fill with buttermilk to the 3/4 cup mark (total mixture of eggs and buttermilk should equal 3/4 cup). Make a well in the center of the flour mixture; add buttermilk and egg mixture and mix just until it pulls together into a soft sticky dough. Fold in the blueberries. The dough will be light and fluffy. 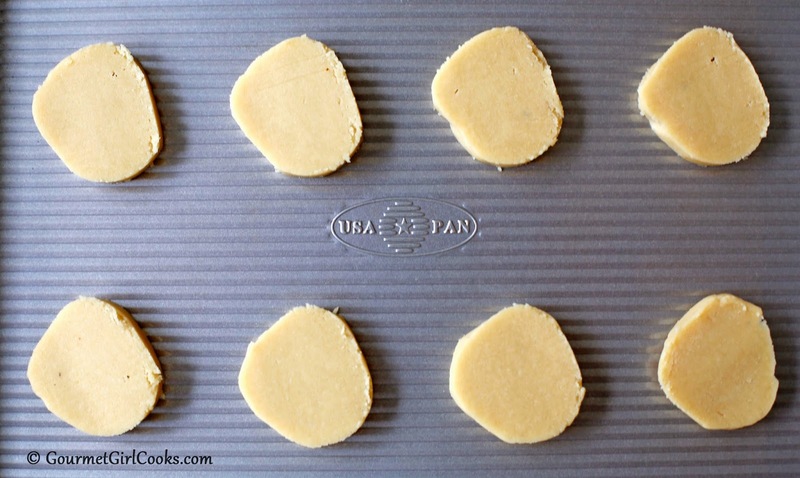 Scoop dough onto prepared pan or baking sheet using a 3-tablespoon size retractable scoop, spacing evenly apart to make approximately 12 equal sized mounds. Lightly tamp down tops to barely flatten top only (do not flatten biscuits). Bake for approximately 20-22 minutes or until light golden brown. Allow to cool for about 5 minutes, then transfer to wire rack to complete cooling. Prepare optional vanilla glaze and spread on top of warm biscuits, if desired. Makes 12. 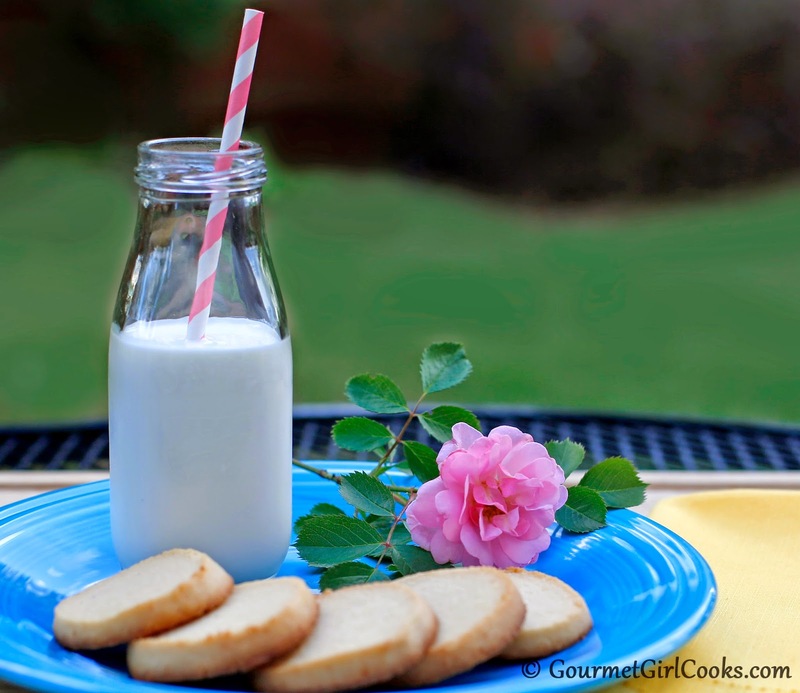 *Notes: Because eggs vary in size and volume, add them to the glass measuring cup first and then fill with buttermilk to the 3/4 cup mark (amount of buttermilk used will be between 1/4 cup to 1/2 cup, depending on the actual volume of eggs). The total liquid mixture should equal 3/4 cup. A tip to keep frozen blueberries from bleeding into the batter is to thaw them first, drain off juice; gently blot and pat dry with paper towels. 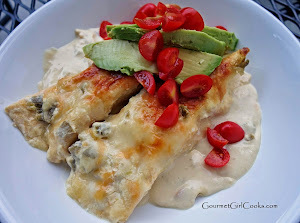 Spread out on a parchment lined plate or baking sheet and freeze to keep from turning batter blue when folding them in. 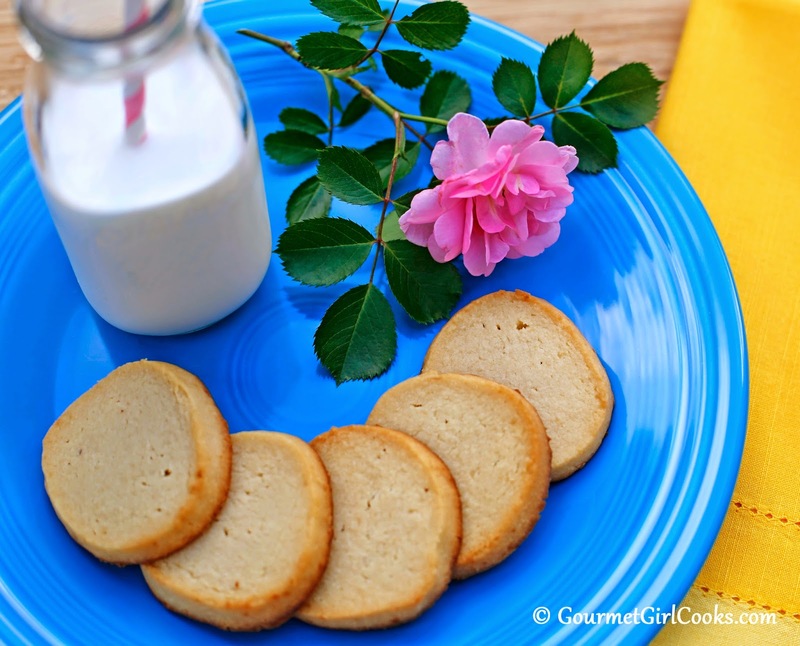 To Make Glaze: Combine cream cheese, confectioners style sweetener, and vanilla. Add cream a few tablespoons at a time, mixing vigorously after each addition until smooth and desired consistency. To adjust sweetness without altering glaze consistency, add a drop or two liquid stevia, to taste. When chilled, this glaze behaves like a rich and fluffy frosting. 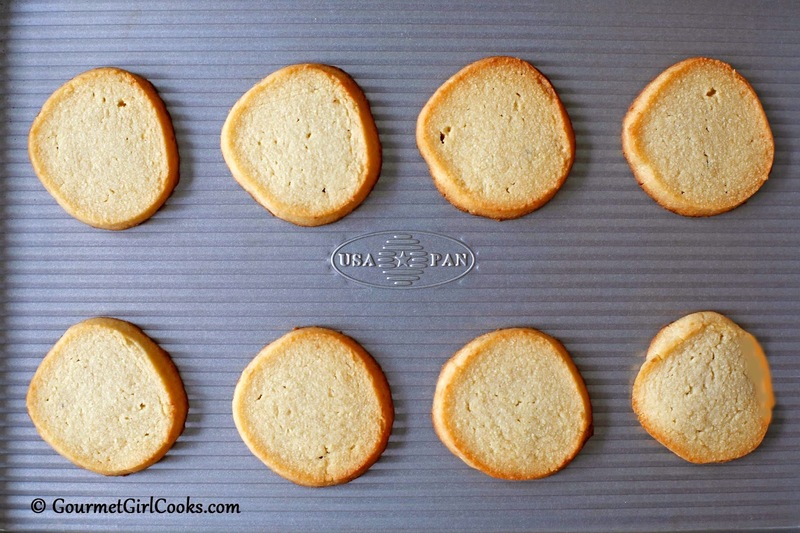 When warmed or spread on a warm biscuit, it melts and behaves as a glaze. Refrigerate any leftover glaze. 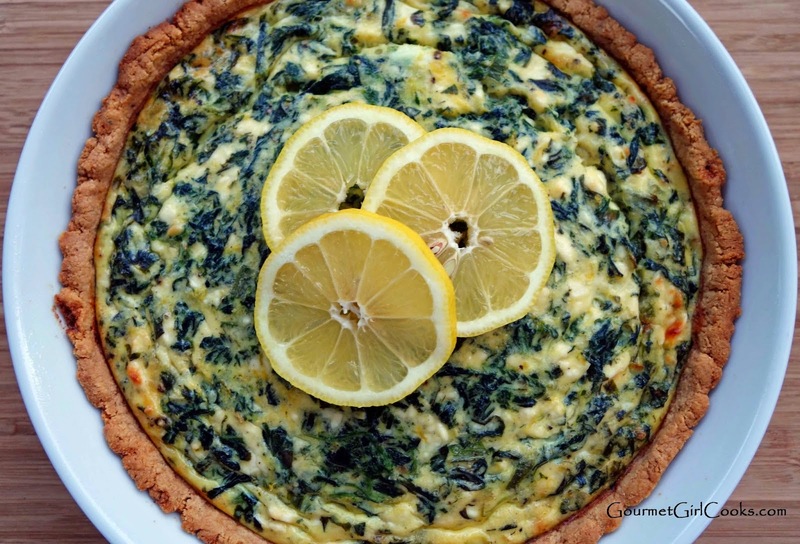 *Note: If desired, add 1/2 to 1 teaspoon finely grated lemon zest to glaze. 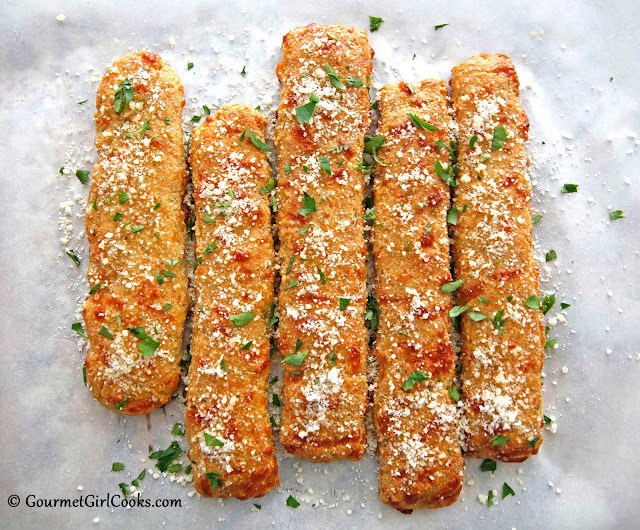 Today I'm re-sharing my recipe for Cheesy Italian Breadsticks.These breadsticks are amazing and really delicious dipped in pizza sauce. We absolutely love them! 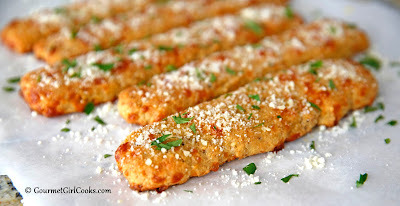 If you miss serving bread along with your meals, these breadsticks are the perfect answer and they are easy to make. The leftover breadsticks go beautifully alongside your scrambled eggs and omelets for breakfast, too. 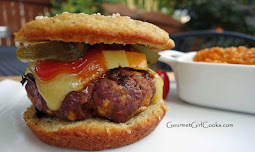 Check out the step by step photos and the recipe below. Enjoy! Preheat oven to 375 degrees F. Line a baking sheet with parchment paper (or lightly grease a nonstick baking sheet). In a mixing bowl, mix first 10 ingredients together with a whisk to help break up any lumps; stir in shredded mozzarella. In a small bowl, lightly beat eggs, buttermilk and olive oil together. Add wet mixture to dry ingredients, mixing just until combined and dough pulls together; lightly shape into a ball. Allow dough to sit for about 5 minutes; dough thickens as it sits. 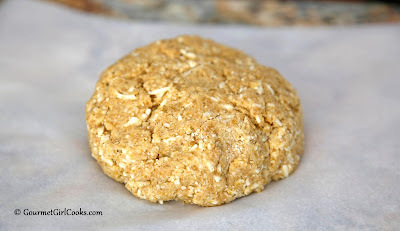 Place ball of dough in the center of a sheet of parchment paper on counter or work surface. Cover dough with an additional sheet of parchment paper and roll dough out between parchment, using a rolling pin, into a rectangular or oblong shape, about 9” x 12” (½-inch thick). 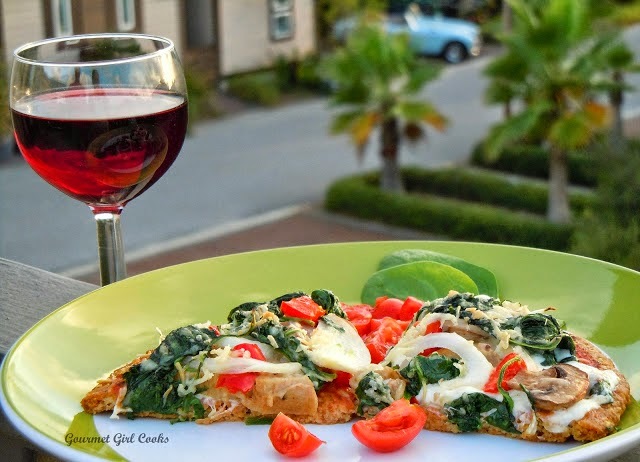 Lightly grease a pizza wheel or sharp knife and cut into approximate 1-inch wide strips. 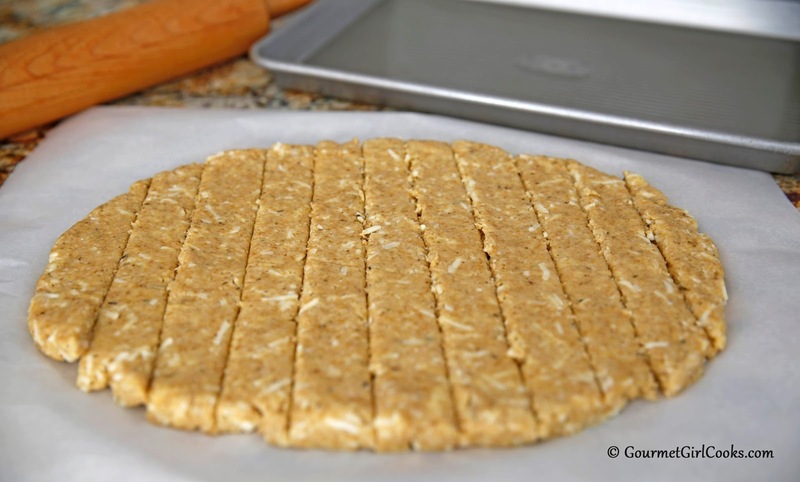 Carefully transfer strips of dough to prepared baking sheet and space about 1-1/2 inches apart. Bake for approximately 15 to 18 minutes, or until golden brown. 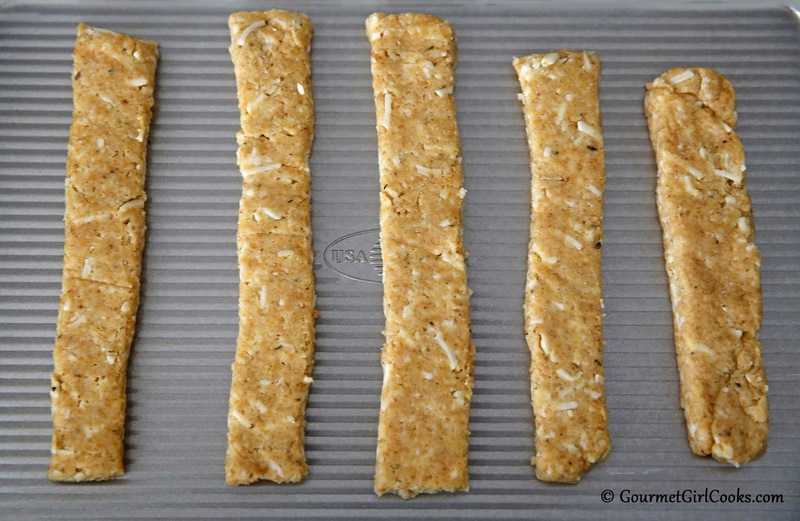 Makes approximately 1 dozen breadsticks, or if desired, cut strips of dough in half lengthwise to make 2 dozen 4-inch sticks. Remove breadsticks from oven and brush with melted butter and sprinkle with Parmesan and parsley before serving. 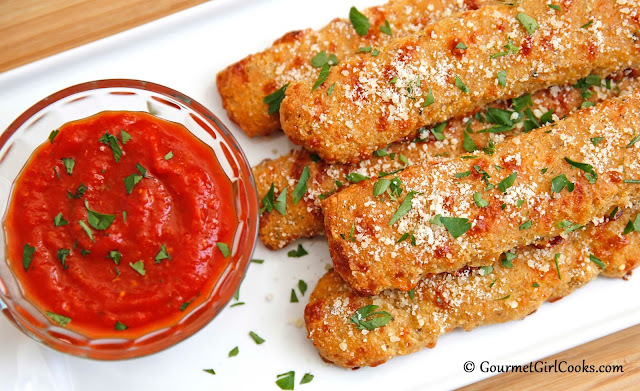 If desired, serve with your favorite marinara or pizza sauce for dipping. 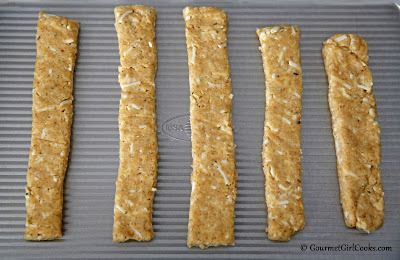 *Note: If breadstick dough breaks while transferring to baking sheet, simply press dough lightly back together. 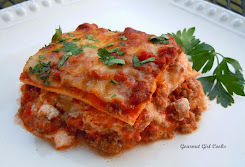 This evening I'm reposting one of my old favorite recipes. It's one I created a couple of years ago. 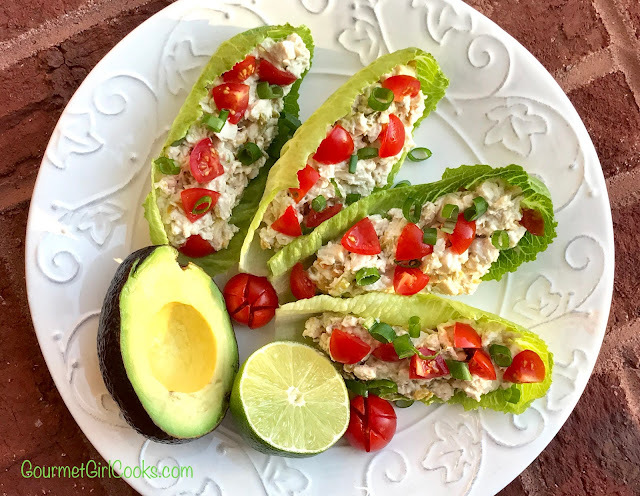 They are SO very easy to make and absolutely delicious. It's my Shortbread Cookie recipe. 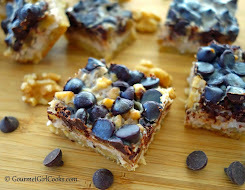 I've posted the original recipe as well as a link to a Chocolate Chip Shortbread version that simply folds in 1/4 cup of chocolate chips (I use 70% cacao chips). 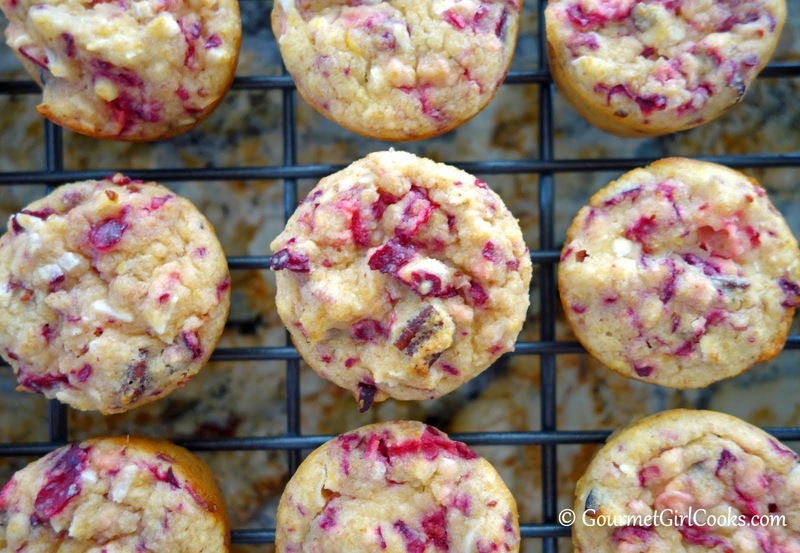 They are delicious either with or without the chocolate chips. 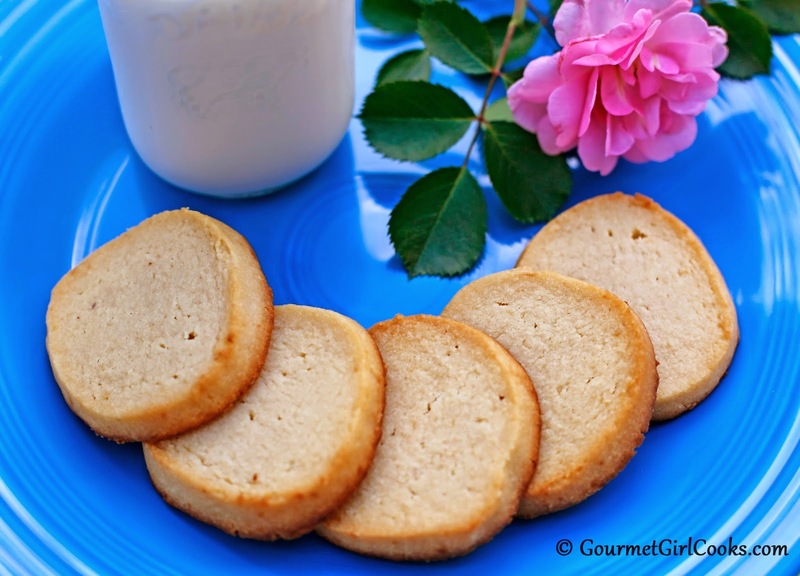 Shortbread cookies are a basic butter cookie that are typically not too sweet. However, they can be dressed up to become the most decadent cookie if you choose to by simply stirring other ingredients into the batter, glazing them, flavoring the dough, frosting or cutting them out into all kinds of cute shapes (dipping them in melted chocolate or ganache would be awesome). They are easy to make, delicious, and can be simple or elegant depending on how you choose to make them. After mixing the dough together, it gets rolled it into a log, wrapped and chilled until firm and then "voila"...you've got slice and bake cookies! I really love these cookies. 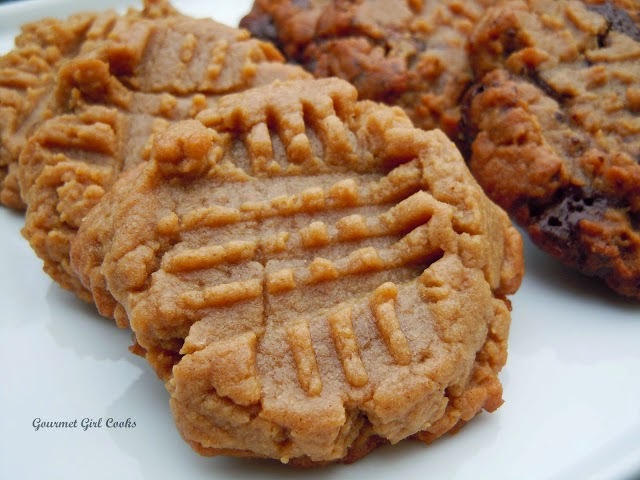 Check out the recipe for these beauties below. Enjoy! In a medium bowl, cream together butter, vanilla, salt and powdered sweetener. Add almond flour and mix until dough forms. Taste dough for sweetness and if additional sweetness is desired, add tiny amounts of liquid stevia to the dough to achieve desired sweetness. 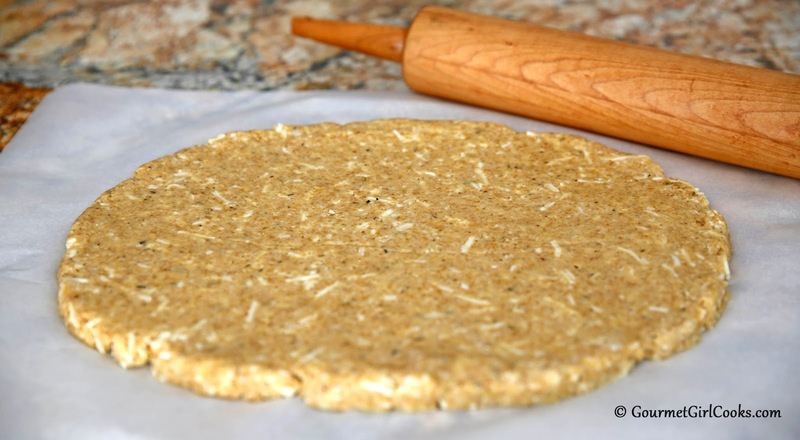 Scoop the mound of dough into the center of a sheet of plastic wrap, wax paper, or parchment paper. Using your hands, roll dough into an approximate 2-inch diameter cylindrical log; wrap and refrigerate dough until chilled and firm, about 1 hour (the dough can also be made ahead of time and refrigerated for several days). 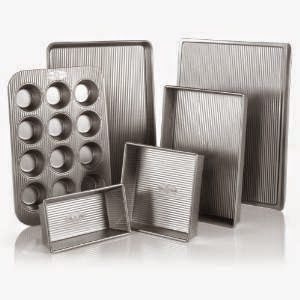 When ready to bake, preheat oven to 350 degrees F. Lightly grease or line a baking sheet with parchment paper. 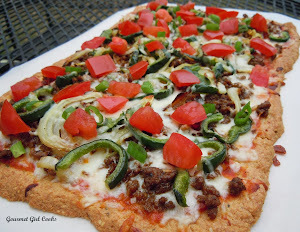 Slice chilled dough into approximate 1/3-inch thick slices and place on baking sheet, spacing about 1 inch apart. Bake for 10-12 minutes or until light golden brown. Cool on pan for about 10 minutes, then transfer to a wire rack to finish cooling (cookies firm up as they cool). *Notes: Granular sweeteners (like erythritol, Swerve, Truvia, etc.) 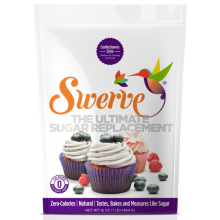 can easily be powdered by using a small food processor or coffee grinder which helps eliminate the grittiness sometimes created when using these type sweeteners. Variations of this cookie can be made using the basic shortbread cookie dough; dip in melted chocolate, drizzle with glaze, frosting, or using different extracts or citrus zests, to create different flavors (e.g. adding 2 teaspoons of lemon zest to the dough for lemon shortbread cookies). 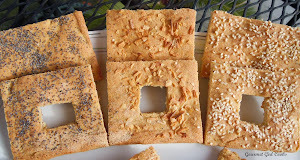 Sandwich type cookies can be created by placing decadent fillings between 2 cookies. Chilled dough can easily be rolled out and cut into different shapes with cookie cutters and then decorated. 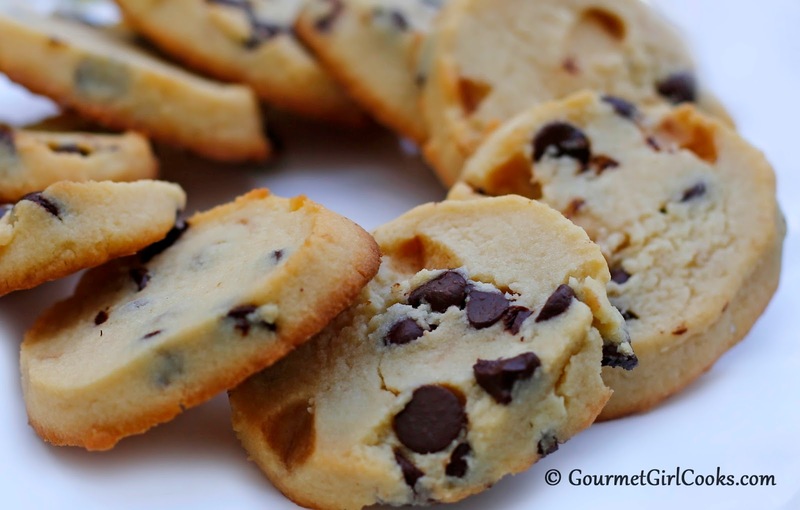 To make Chocolate Chip Shortbread cookies, fold 1/4 cup chocolate chips into the dough before chilling. 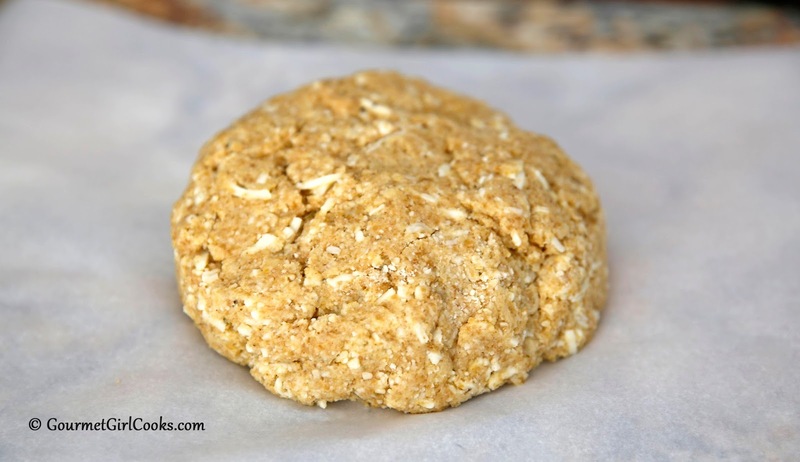 *Nutrition Information: For 24 cookies, each cookie contains approximately 2 net grams carbohydrates (total carbohydrates minus fiber) and less than 1 gram of sugar. This evening I made our first wild Alaskan Coho Salmon of the season. It was absolutely delicious. For those that aren't wild about fish, this variety of salmon is very mild flavored. I found it at Sprouts Farmers Market for $9.99/lb. I bought a large 1-1/2 pound fillet. I prepared it by roasting it on the grill and basting it with lime butter. 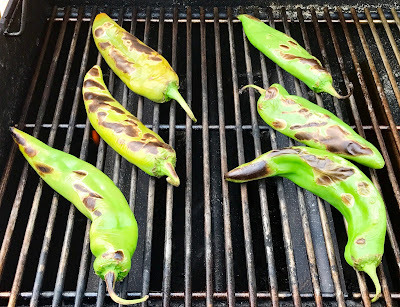 It only took about 8 minutes to cook at 400 to 425 degrees F. I made a creamy Hatch green chile and lime sauce to top it with by using some of the Hatch chiles I roasted earlier in the week. It was delicious and a bit spicy (reduce the amount of chiles for a milder sauce). 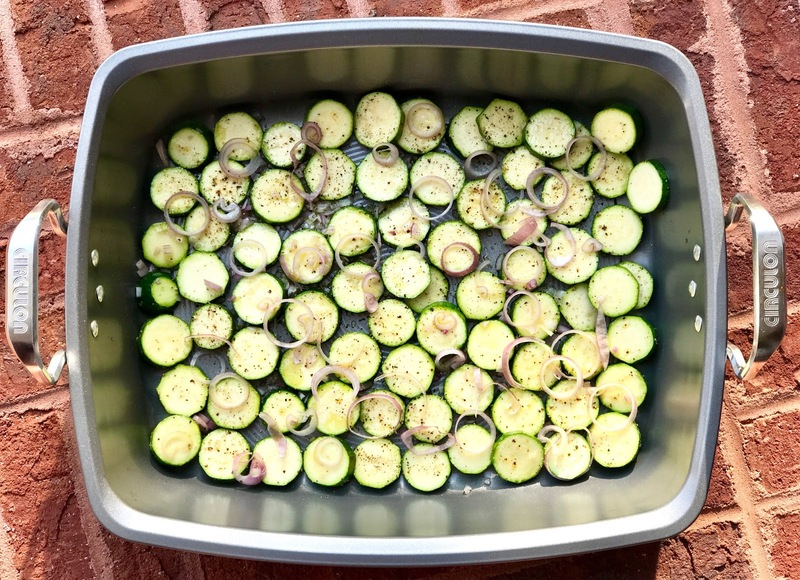 To go with our salmon, I sliced up 5 small zucchini and 2 shallots and tossed them with olive oil and seasoned with salt and pepper and roasted them in the oven at 400 degrees for about 30 minutes, stirring them once. They were absolutely amazing. Cooking veggies without using water is the way to go if you are able to because roasting vegetables brings out their natural sweetness. I sliced up a large ripe heirloom tomato and seasoned it with salt and pepper and drizzled it with extra virgin olive oil. It was the perfect "end of August" summer meal. I snapped a few photos below and included the easy peasy recipe for the salmon. Enjoy! Preheat grill (or oven) to 400-425 degrees. Place salmon fillet in center of large sheet of foil. Combine butter, lime juice, lime zest and salt in a small bowl. Brush all over salmon. Gently crimp and form foil into a packet around salmon fillet to hold butter and juices as it roasts (keep packet open on top while roasting). Place on hot grill and close lid. Try to maintain grill temperature between 400 and 425 degrees F. Cook for 8 to 10 minutes, depending on thickness of fillet. Remove and transfer foil packet to a platter or baking sheet. Crimp and close packet tightly to allow salmon to continue cooking gently off the heat for about 5 minutes. While salmon is roasting, prepare sauce. In a sauce pan, melt butter, stir in cream cheese and cook on low until melted, about 1 to 2 minutes. Stir in stock and simmer over medium heat, whisking until smooth and slightly thickened and bubbly, stirring frequently. Stir in lime zest and green chiles and cook over low heat for 1 minute. Stir in sour cream and heat just until hot and begins to bubble; do not to boil. Remove from heat; sauce thickens as it begins to cool. Spoon over salmon or serve on the side. *Note: Reduce the amount of chiles for a milder sauce. Last night I made a delicious and oh so simple meal that we enjoyed again tonight. I grilled boneless chicken thighs that I coated in a large pot with olive oil, McCormick's Grill Mates Chipotle & Roasted Garlic Seasoning, and the zest and juice of a tangerine. I grilled them on high for 5 minutes on each side (about 400-425 degrees F), then moved them to a platter and covered with foil and let them sit for about 5 to 10 minutes. They were delicious and the subtle undertone of tangerine was a bit more prominent when we ate the leftovers this evening. The zest is what gives it the most flavor but it's still delicate and if you wanted it to be stronger you could simply add more tangerine zest. 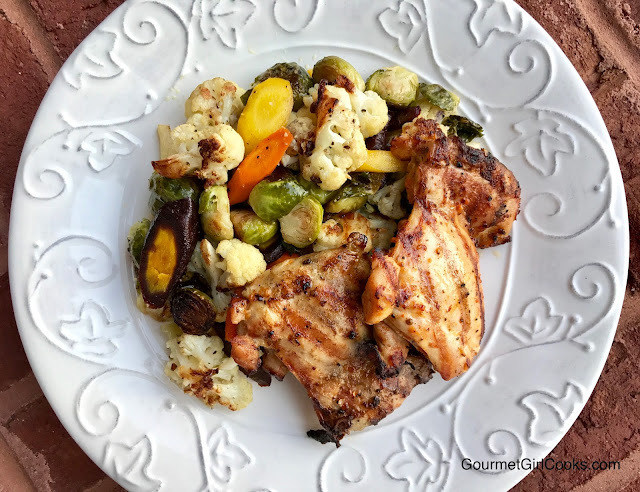 Both hubby and my favorite part of the meal last night was the Roasted Vegetable Medley that I made to go with our grilled chicken. 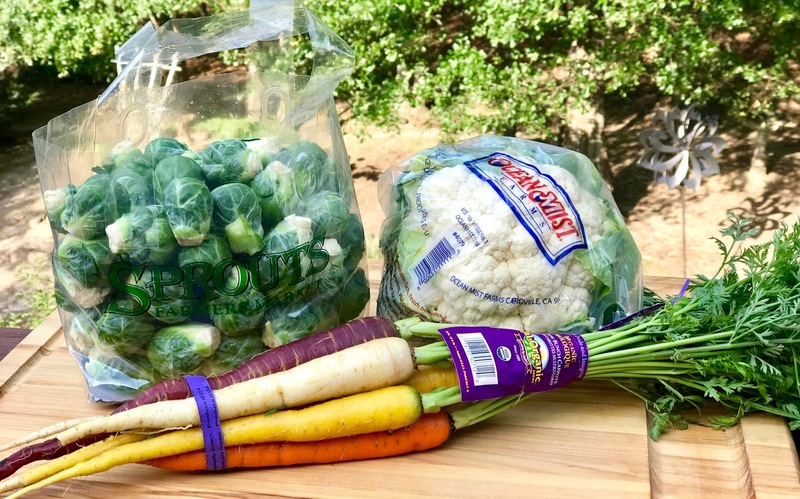 I stopped at Sprouts Farmers Market on my way home last night and picked up a bag of fresh brussels sprouts (I only used 1 pound of the 3 pounds that I bought), a small bunch of organic rainbow carrots (5 to 6 slim carrots that were white, yellow, purple and orange), and a small head of fresh cauliflower. I halved the sprouts, sliced the carrots diagonally on the thin side and cut the head of cauliflower up into florets. I placed everything in a big bowl and coated them with olive oil and generously seasoned them with sea salt and black pepper...that's it. I roasted them for about 30 minutes and they were absolutely awesome...not just good but amazing. We both agreed we could literally have made a meal on just the veggies. I made a big huge pan of veggies so we enjoyed them again this evening. I still have just enough food left for one more meal. I own probably 4 or 5 different roasting pans and I purposely chose my Circulon roasting pan because it has a textured and ribbed bottom that I believe help the veggies brown even better, but any roasting pan will do. I just think that veggies taste so much better when cooked with little or no water (roasted, sautéed or steamed). 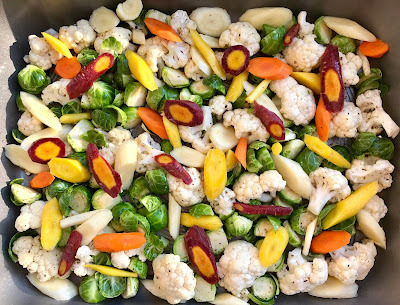 I snapped a few photos below and included the easy peasy recipe for my Roasted Vegetable Medley. You can swap out and use whatever veggies you like. Enjoy! 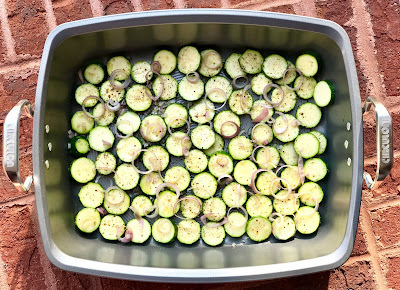 Preheat oven to 425 degrees F. In a large bowl or pot, add vegetables, olive oil, salt and pepper. Toss to coat evenly. 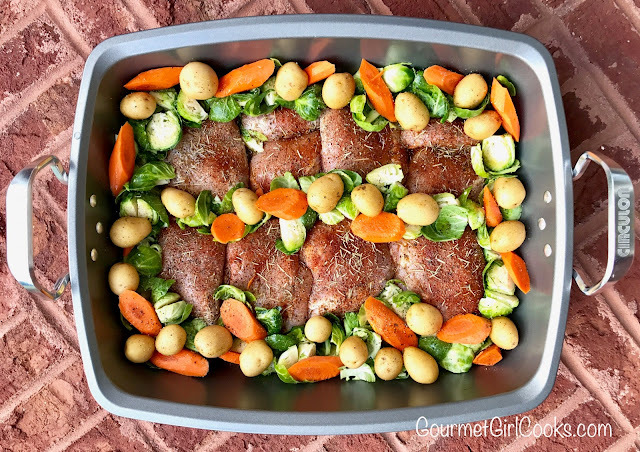 Spread in a single layer in a large nonstick roasting pan. Place in oven to roast for 15 minutes. Reduce oven temperature to 400 degrees, stir vegetables and continue roasting at 400 degrees F for another 15 to 20 minutes, or until they have begun to brown and caramelize. 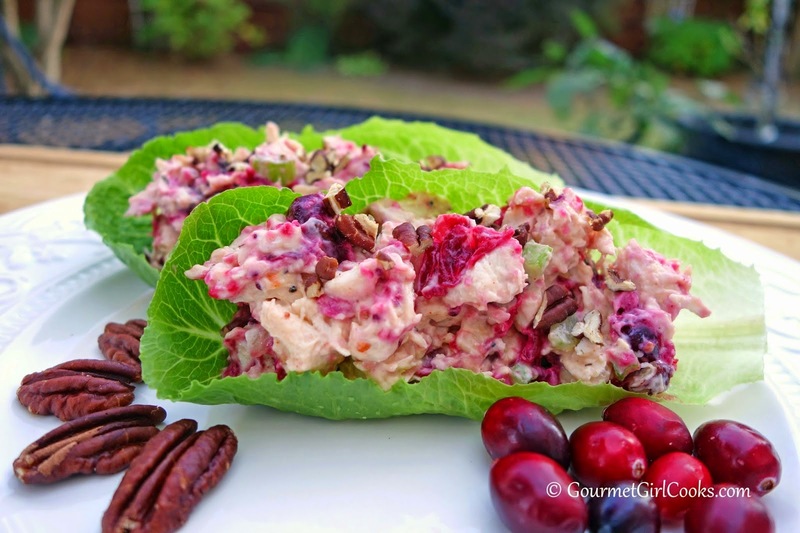 Hatch Chile Chicken Salad - It's Hatch Chile Season! 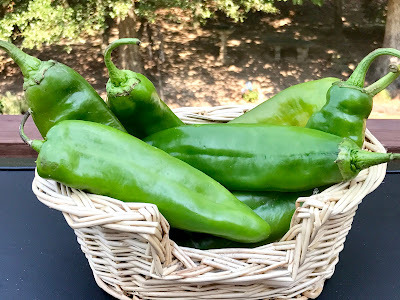 This past weekend, I picked up half a dozen fresh Hatch Chiles. 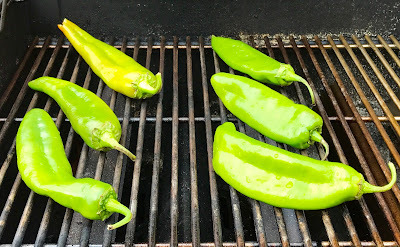 I've bought salsa made from them before and loved it but I wanted to use fresh Hatch chiles and roast, peel and seed them myself and use them in some new recipes. Hatch green chiles are grown exclusively in the Hatch Valley located in Hatch, New Mexico. They have a very short growing season that lasts from August to September. I was so excited when I stumbled upon them at The Fresh Market this past weekend. 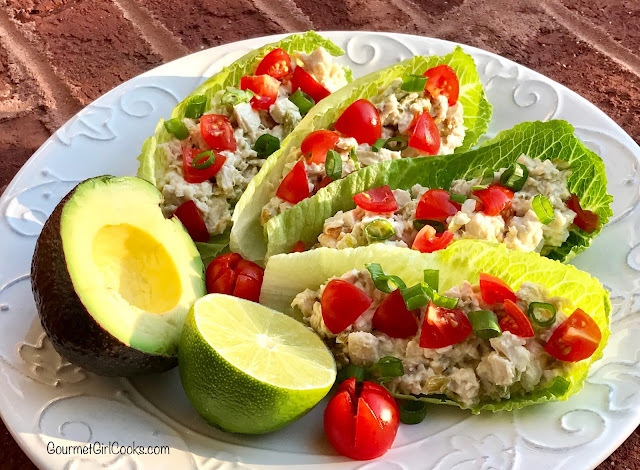 I was in the mood for chicken salad which is one of my favorite things, especially in these dog days of summer, so I decided to incorporate them into a recipe for Hatch Chili Chicken Salad. It only takes about 10 minutes to roast them on the grill, turning them every few minutes. I then placed them in a bowl covered with plastic wrap for about 15 minutes until they cooled down and the steam helped loosen the skins. The skins came off easily, then I split them lengthwise and removed the seeds. 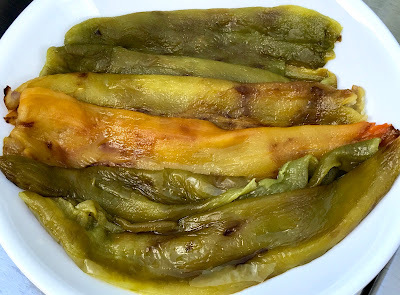 I used 3 in this recipe (use more or less, to taste) and have 3 roasted Hatch chiles left to do something else with. It turned out great and hubby enjoyed it too. If you want to give these peppers a try while they are available fresh, you'd better get them soon. 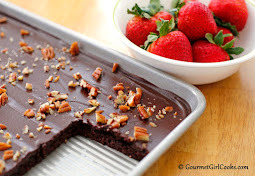 I snapped a few photos below and included the easy peasy recipe. 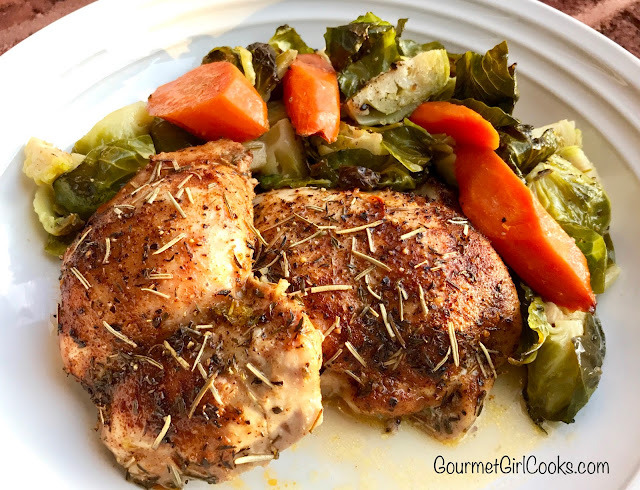 To save time, rather than poaching chicken breasts like I did, a rotisserie chicken would make this a super quick and easy meal. Enjoy! In a small bowl, whisk mayonnaise, sour cream, cumin, salt, lime zest and juice, pickle juice and green onion. Taste dressing for seasoning and adjust, if necessary. Fold mixture into chicken and refrigerate. Last week I made a super easy meal with a package of boneless skinless chicken thighs I picked up at Sprouts Farmers Market. It was a large pack with 8 plump thighs in it. I also picked up a bag of fresh brussels sprouts and another bag of tiny creamer potatoes (the potatoes were for hubby). 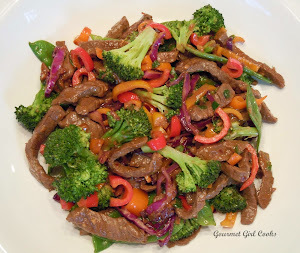 This meal was so good, yet so simple and we literally ate it for 3 nights (which is a rare thing for hubby since he usually turns his nose up to leftovers). 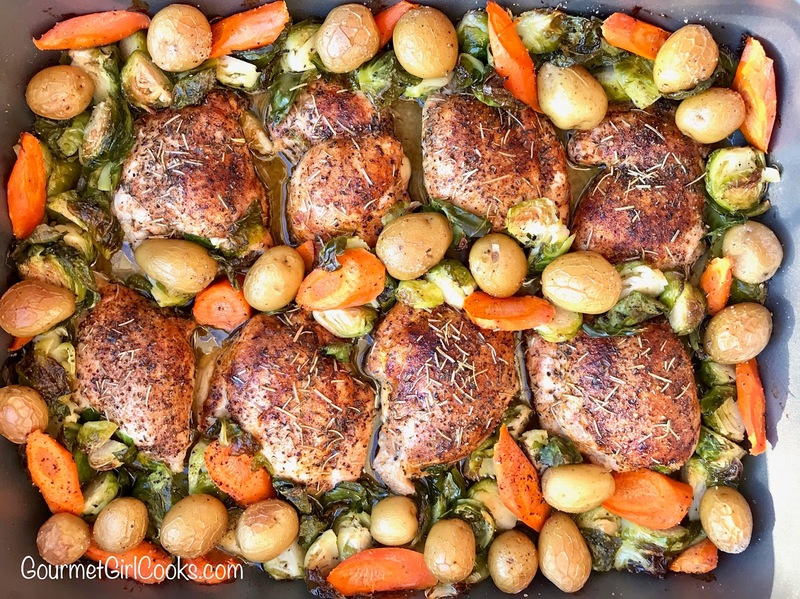 This dish is similar to all the "sheet pan meal" recipes you see around but this one is cooked in a deep roasting pan instead which keeps everything from splattering all over the inside of your oven (win/win). I can't even tell you how delicious this was by simply roasting everything together. 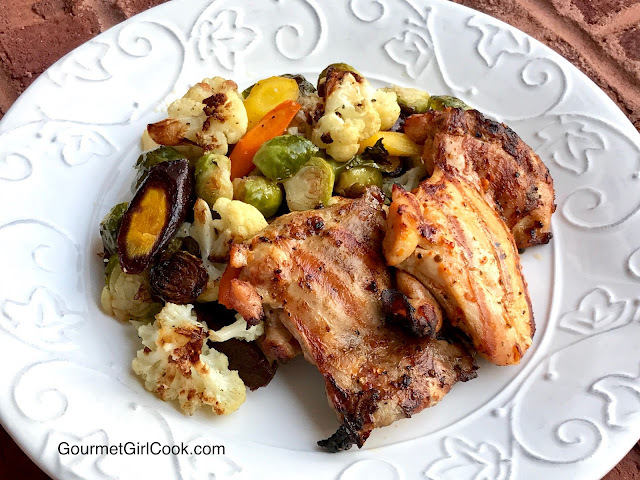 It made the veggies so delicious and the chicken so moist and tender (yes, even without any skin). The chicken remained moist and tender even when reheated the next day. I reheat on 60 or 70% power so nothing gets tough and remains just as tender and juicy as it was the first night. 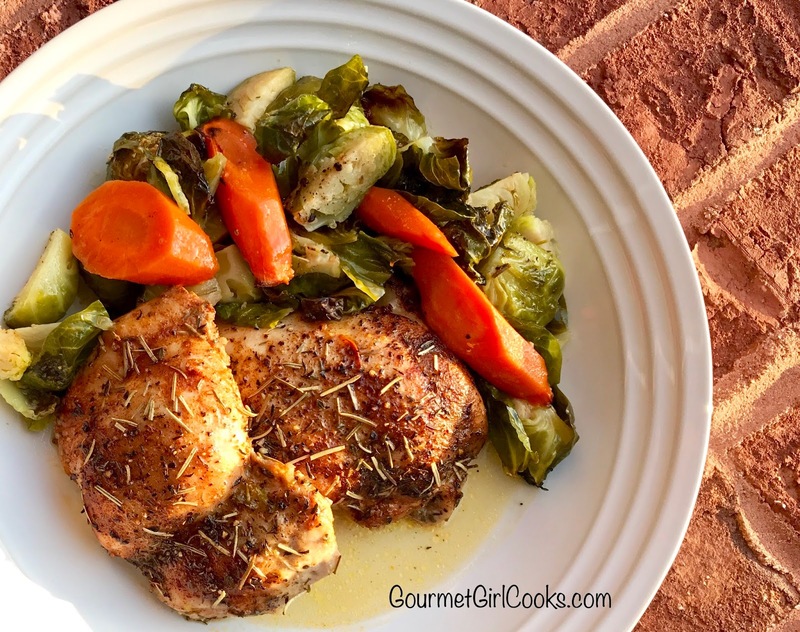 This dish was the perfect weeknight meal where everything cooks together in the same pan and is done at the same time. I can't tell you how nice it was to get meals for 3 days last week, particularly after our upstairs air conditioning unit went out last week and it was 93 degrees upstairs (yikes)! 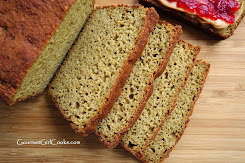 Over the years, I've had folks tell me how difficult it is trying to cook separately for family members that aren't grain free or low carb without making two different meals. Well this dish is one that can please everyone...most importantly you, the cook! The potatoes I used were small creamer potatoes the size of large cherry tomatoes and everything cooks together and is cooked perfectly at the same time. You simply add the potatoes to the plate of the family members that aren't low carb. It's as simple as that! 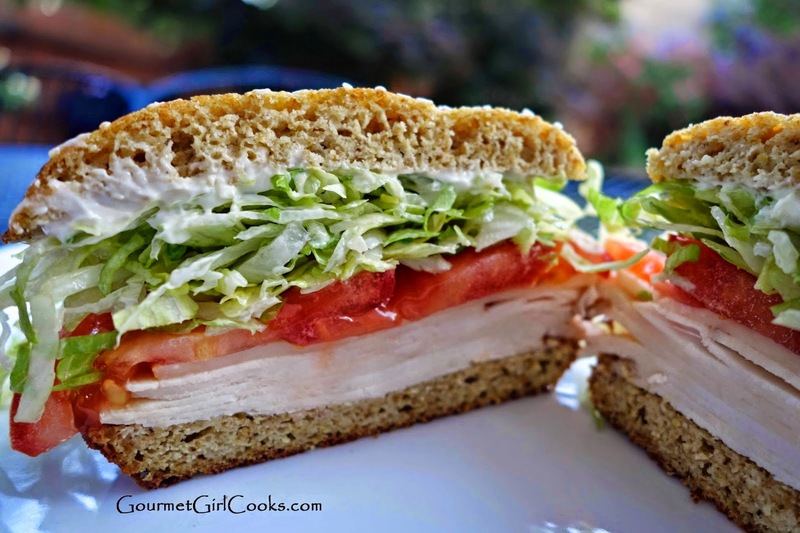 I snapped a few photos below and included the easy peasy recipe. Enjoy! In a large nonstick roasting pan, place thighs, spacing about 1/2-inch apart. In a large bowl, add sprouts, carrots, and optional potatoes; toss with 3 tablespoons olive oil and season with salt and pepper, to taste. 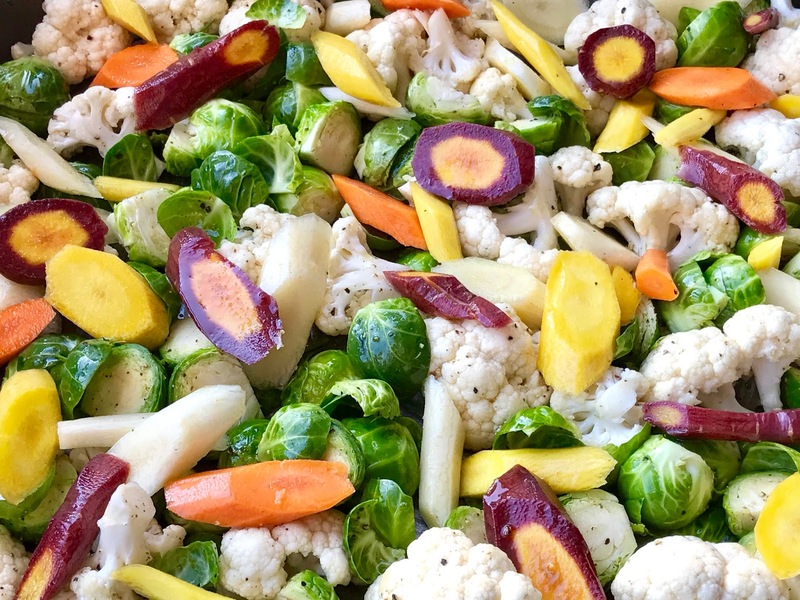 Toss veggies until evenly coated with oil. Spoon vegetables around chicken in pan. Drizzle remaining olive oil over chicken pieces. Season generously with salt and pepper, to taste. Sprinkle chicken with paprika and top with thyme and rosemary. Roast in a 425 degree oven for 30 to 40 minutes, or until chicken is done, reaching an internal temperature of 165 degrees. Baste chicken with pan juices about half way through cooking. This evening both of my sons came for dinner. 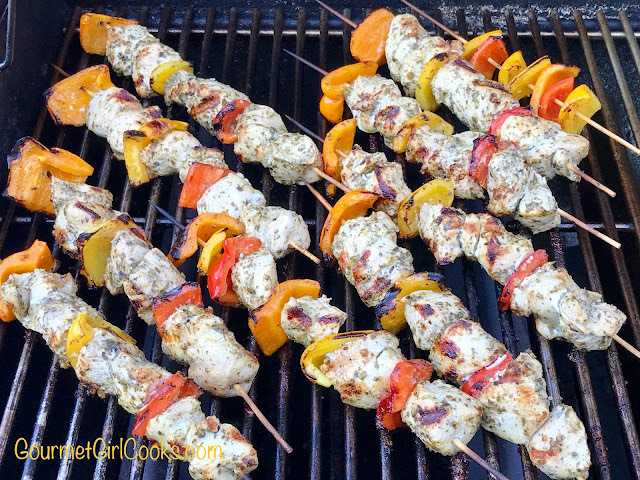 I made easy and super delicious Grilled Lemon Pesto Chicken Kabobs. They turned out great and were super flavorful and tender. 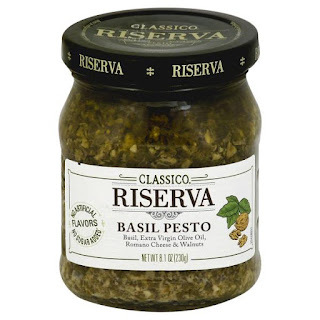 You can use your own homemade pesto if you want or use one of the many brands of already made pesto. There are a number of good brands that I've used. Tonight I used Classico's Riserva Basil Pesto (Mezzetta also makes a delicious pesto as well). 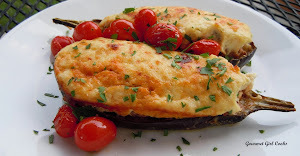 It's made with basil, extra virgin olive oil, Romano cheese and walnuts (instead of pine nuts used in many other brands). I served the kabobs with steamed fresh broccoli and I made jasmine rice for the guys. 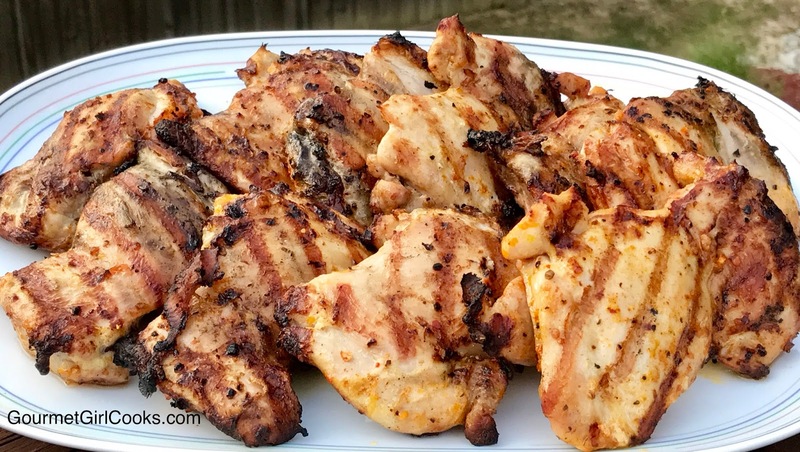 The marinade was super simple to put together and it added such fresh bright flavors to the chicken. 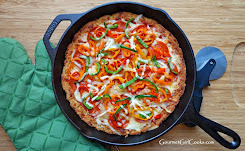 I snapped a few photos and included the easy peasy recipe. Enjoy! In a one-gallon sized Ziploc type bag, add chicken, pesto, lemon zest, lemon juice and salt and pepper, to taste. Refrigerate for 4 to 8 hours, turning bag over occasionally. Thread chicken on metal skewers or bamboo skewers (pre-soak bamboo skewers for about 20 to 30 minutes prior to using). Heat grill to 350 to 400 degrees. Lightly spray kabobs with olive oil spray before placing on grill. Cook covered for 10 to 12 minutes, turning every few minutes until done. This evening I wasn't sure what to make for dinner. I remembered that I had a big 5-pound bag of large 16/20 wild raw shrimp in the freezer, so I poured some of the frozen shrimp out into my colander and ran them under cold water for about 5 minutes to thaw them, then peeled and deveined them. 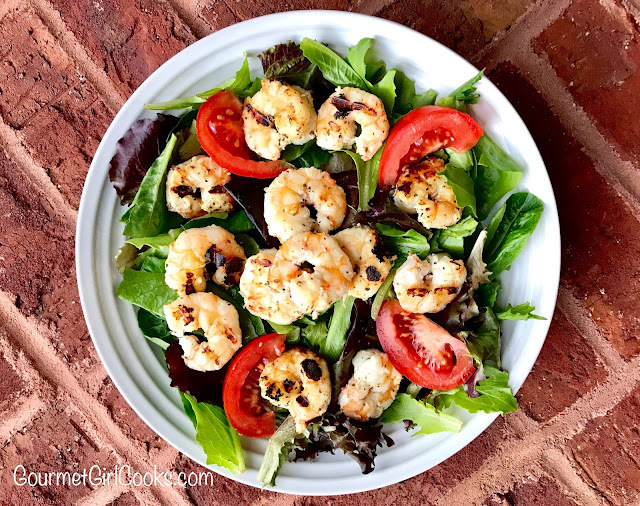 I debated whether to make shrimp marinara or to marinate them and grill them to put on top of a bed of tender baby romaine salad mix. I opted for grilling them for a salad. 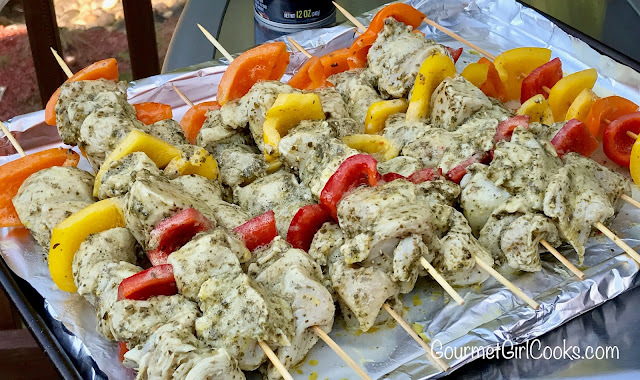 I whisked together a quick and easy lime marinade and then tossed them around in the marinade and let them marinate for about 1 hour in the fridge. 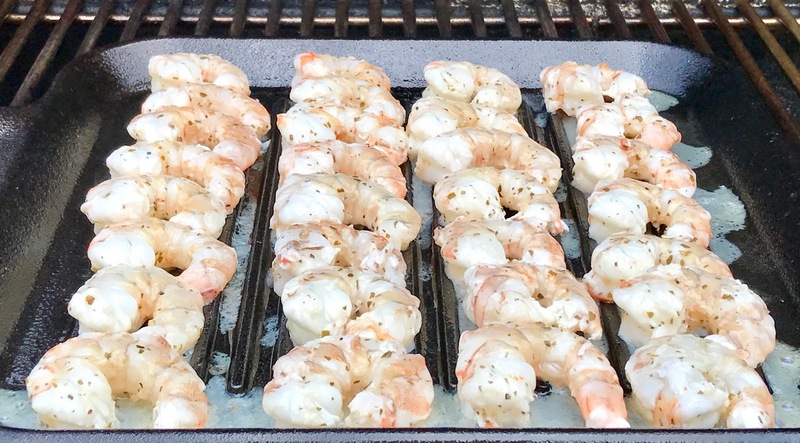 I used my Lodge Cast Iron Grill Pan to grill them on top of my Weber Gas Grill because I didn't want to lose any of the shrimp by having them fall through the grates. They only take a few minutes per side to grill, but as my luck would have it, it was bright and sunny when I started and as soon as I flipped them over to cook on the other side...the sky opened up, the thunder and lightning rolled in...and I scrambled to get them off the grill and inside...but I succeeded! Whew! It was a quick and easy meal to put together. 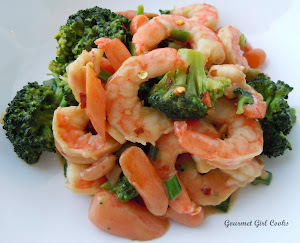 I simply opened up a container of Sprouts organic baby romaine salad mix and placed it in big bowls, cut up a ripe tomato and topped the salad greens with the tomato and shrimp. 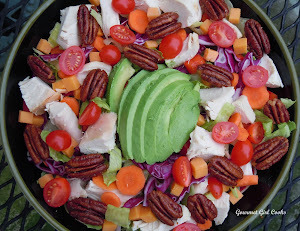 I drizzled on a bit of vinaigrette and we enjoyed a healthy delicious main dish salad. 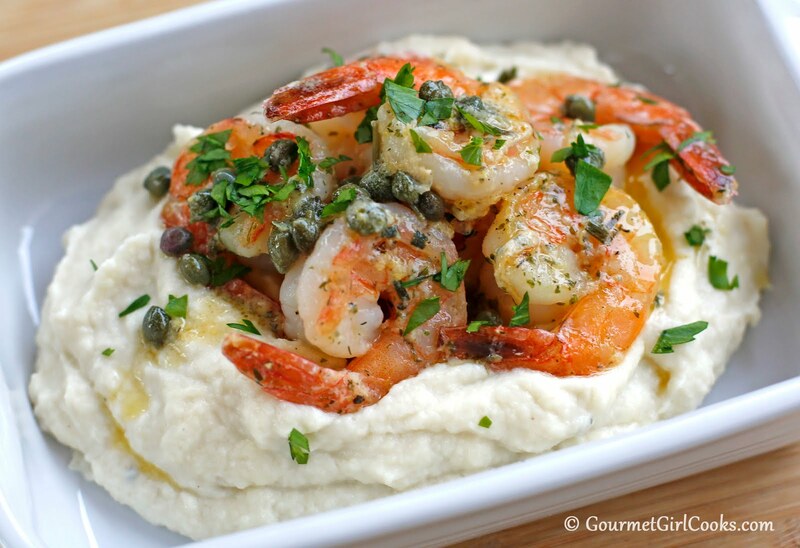 Combine all ingredients except for shrimp in a medium bowl. Taste for seasoning (I added just a faint hint of sweetness to enhance the lime flavor with a bit of stevia but you can omit any sweetener). Add shrimp and stir until coated. Cover and refrigerate for approximately 1 hour, turning once. Heat grill to about 350 to 400 degrees. 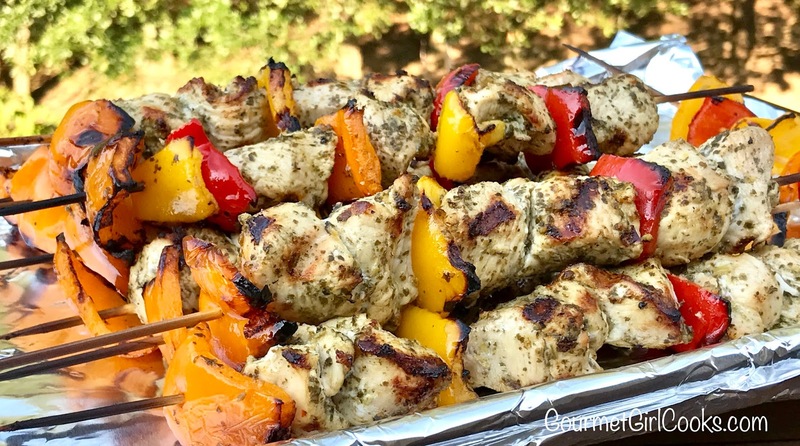 Spray a cast iron or oven safe grill pan or griddle with oil and place on grill until hot. 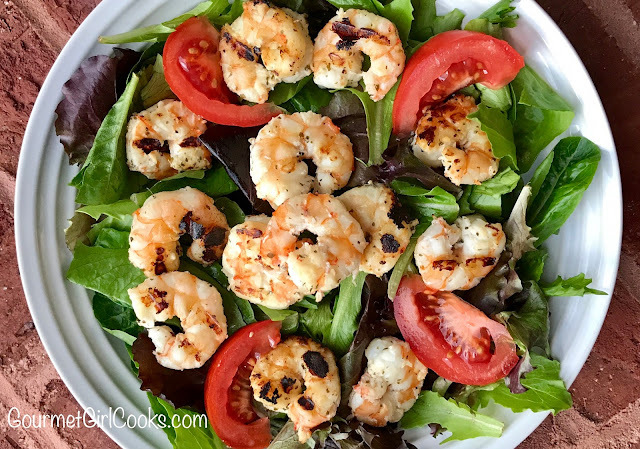 Using a pair of tongs, place shrimp on grill pan; cover and cook approximately 2 to 3 minutes. Turn over and cook an additional 2 min. Serve on a bed of baby lettuces, if desired.